Tim and I were asked by the Literacy Coordinator at Calico Public School (in Toronto) if we would like to participate in their Literacy Night, an evening of fun and festivities to promote reading among their students. Of course, we said “Yes”! 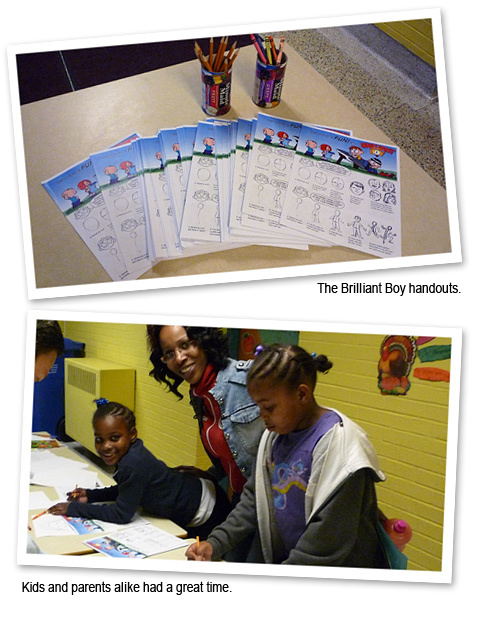 So I created a Brilliant Boy-themed handout that included cartooning tips, Brilliant Boy comic strips, and a comic template for the aspiring cartoonists. As many as 90 students dropped by our table as we gave demonstrations on how to illustrate and cartoon. Kids just love to draw and colour, and it was fun just watching them doodle. We had a great time, and we think the kids did too. Thanks for the invite, Calico P.S. !